If you are at least somewhat familiar with New Hampshire’s White Mountains then you undoubtedly have heard of Dolly Copp. Maybe you’ve even stayed at the Dolly Copp Campground in Pinkham Notch. Did you know that her story resulted in the birth of the term ‘copp out’? But who is Dolly Copp? It’s said that she’s responsible for naming The Imp Face. More importantly the toil and labor of Dolly and her husband had much to do with putting Pinkham Notch on the map in those early days. As a hiker I love to recognize the historical significance of the different areas I hike. Crawford Notch could corner the market with White Mountains history but the early history of Pinkham Notch is not to be disregarded. The building of the Glenn House, the creation of the Auto Road, the advent of the logging industry, the legend that is Joe Dodge and the inception of some of the nations oldest racing ski trails of Wildcat Mountain are all significant contributions to the dramatic history of this once very isolated notch. Before any of these events occurred though, Dolly and her husband Hayes Copp decided to settle in a lonely, godforesaken wilderness and call it their home. Dolly and Hayes Copp were pioneers of Pinkham Notch. They labored in the woods endlessly clearing land for years building their farm and becoming the very first settlers in the notch. They were hardy pioneers in an unforgiving region. As she was never satisfied with “just getting by” and she wanted the best for her family she made herself productive in countless ways and excelled in all of them. She expertly grew her own flax and made her own linens. She transplanted apple trees found in the forest to create her own orchard. It’s fun to search for these trees at the homestead site even today. Her homemade soaps were a sought after luxury. She carded and spun her own wool and collected honey for her homemade delicacies. She began supplying the new grand hotel, the Glenn House, with her wonderful linens and her homemade culinary goods. The wealthy guests of the Glenn House treasured her wares and she became well known throughout the New England Region and beyond especially for her fine linens and apple butter. The Imp Face could also be known as the ‘other stone face of New Hampshire’. It is a grizzly looking ledge on North Carter Mountain that has the appearance of a devilish face. The face could be seen directly from Dolly’s front yard. In fact, Dolly’s front porch was the best viewing location of the face. Stage coaches full of tourists that passed through Pinkham Notch would stop at her homestead to view it. It is said that Imp Face was named by none other than Dolly Copp herself. She welcomed visitors and spent time talking with them about the mountain. 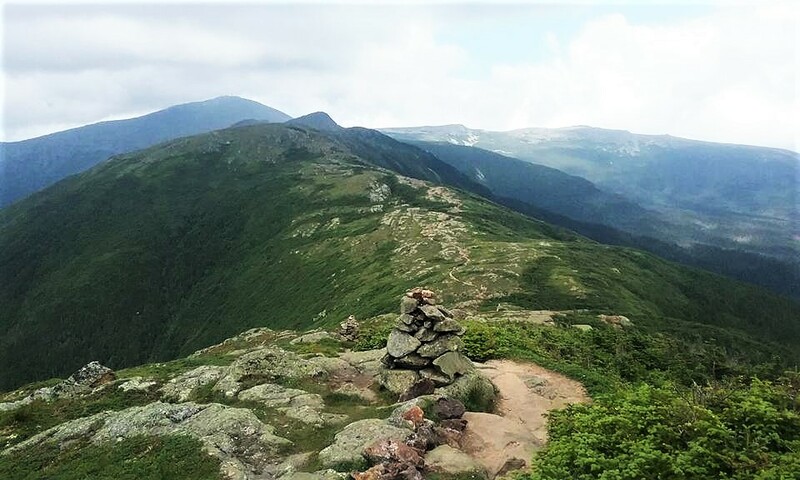 Today The Imp Face is a popular hiking destination in Pinkham Notch and the best viewing location is still from the Copp homestead. After 50 years of marriage to Hayes, Dolly is famously quoted as saying, “Hayes is well enough, but fifty years is long enough for a woman to live with any man.” And just like that she left her life in the notch and all her contributions to the tourist industry in the area and went to live with her daughter in Maine. The term folks used was that she ‘copped out’. Next time you hear this expression you will know where it originated from. The Copps, the very first setters in Pinkham Notch, moved on to separate lives but remained on friendly terms for the remainder of their time on earth. Hayes and Dolly Copp are true legends of Pinkham Notch. One can only hope that they realized their significance to the splendid history of this area. The Copp homestead site is within the Dolly Copp campground off Route 16. I explored the homestead site and hiked up to the Imp Face. To get the most out of my time in Pinkham Notch, I extended my hike up Imp Trail North past The Imp on to Middle and South Carter. I hiked out via Carter Dome Trail and 19 Mile Brook Trail back to Route 16. You will need a car spot to hike this route or a road walk of 1.5 miles. The hike is moderate/difficult. Footing is very good and grades are moderate however it is a long hike at just over 12 miles including 1.5 miles of road walk. 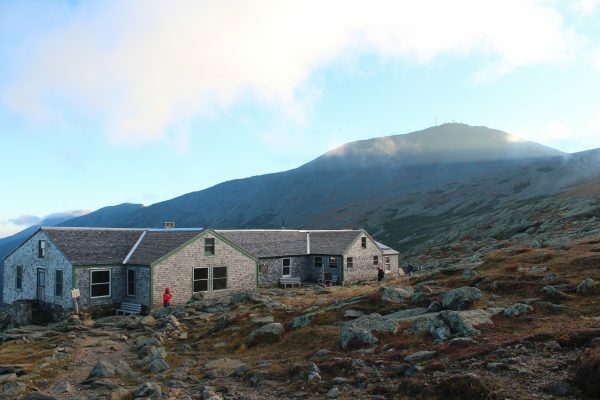 Begin early, check weather forecasts, ensure you have the 10 essentials and enjoy this beautiful hike through the Carter Mountain Range with the highlights being expansive views, the Imp Face Ledge and the strong history of the region. While at the Homestead explore the area just south of where the house stood and try to locate some of apple trees left over from Dolly’s orchard. How better to feel a connection to Pinkham Notch history than to bite into an apple from a tree planted by Dolly Copp herself. Start early and pack a breakfast to enjoy on The Imp Face. Take your time there enjoying the views of the Presidential Range before heading off for the rest of the hike. It’s a lovely, serene spot and should not be rushed. It’s best to park at Nineteen Mile Brook Trailhead and walk 1.5 miles to Imp Trailhead North to begin your hike. This way you won’t have a long road walk awaiting the end of your hike. The Imp Trail North is a moderately graded trail. The Imp Face can be seen through the trees here with the sun lighting it up. A tease of the spectacular views that await! Views of the Imp Trail North steadily climbing the side of North Carter Mountain. Views of Washington and the Presidentials from The Imp Face. The Views just before the summit of Middle Carter are some of the most dramatic of the day. More views of Mt. Washington and the Presidentials and expansive views of Wild River Wilderness. You will want to take your time at each of the outlooks. The Summit of Middle Carter is wooded and viewless however you are sure to encounter some Gray Jays there. There is some descending and some climbing between Middle and South Carter but this is the last of the real work of the hike. It’s all downhill from South Carter. The summit of South Carter is also wooded. There is an outlook just past the summit overlooking the Wild River Wilderness. There is plenty of water available on the Carter Dome Trail and some really beautiful spots to take a snack break. Once you hit the junction of Carter Dome Trail and Nineteen Mile Brook Trail you are on the home stretch and although the walk out is relatively long after a big hike like this, it’s pretty easy going. Trail Map – Red Stars highlighting trailheads and the Copp Homestead Site. While you could say there’s been much progress and change since Hayes Copp first decided to clear his home site in this area you also feel not much has changed. We’re still able to lay eyes on the same sites and scenery that the Copps enjoyed hundreds of years ago. You can still get that sense of isolation from the rest of the world while hiking deep in Pinkham Notch and it is simply extraordinary. Happy Trails!